5.20ct Paraiba @ $1000/ct - $5,200 SOLD! This is guaranteed Paraiba Tourmaline. 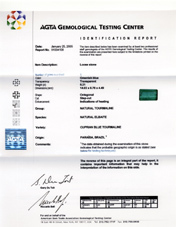 Certified by AGTA (American Gemological Trade Association). The cost of Certification was over $500. The certificate will be sold with this gem. This is NOT A PARAIBA LOOK-A-LIKE! This is the real thing. 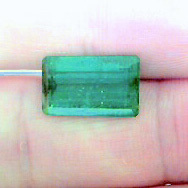 Paraiba has been found in different colors and this one is a real blue-green or green-blue. 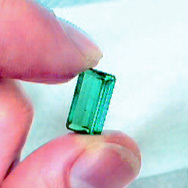 This was part of a parcel of Paraiba that was purchased in 1989 when the material was discovered. 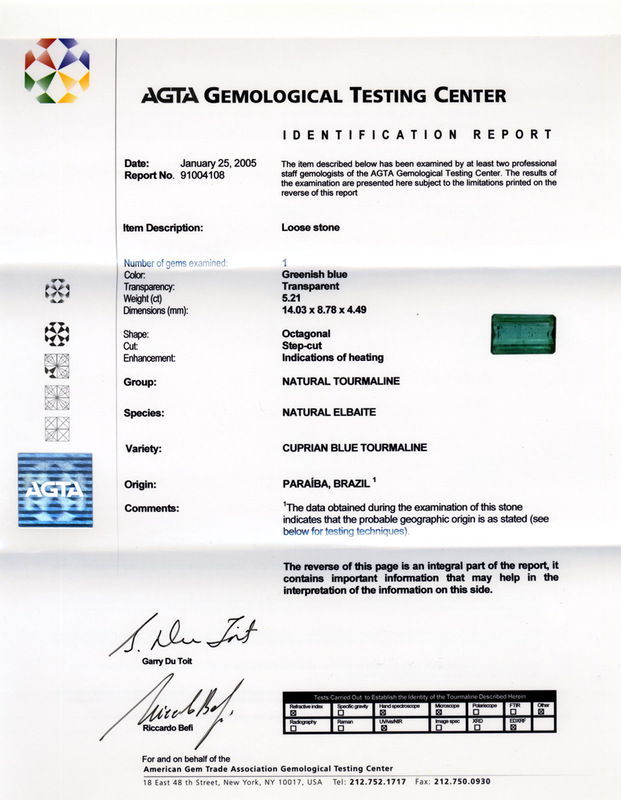 View the AGTA Cert - No doubt this is the Real Deal - Paraiba Tourmaline! Note that unlike most businesses in the trade, we don't believe that the presence of Copper should mandate high prices. Color, regardless of whether or not a gemstone contains Copper, should be the determining factor. We have had Paraiba in stock shortly after the discovery. Our last purchases were in 1989 and 1990. The stone pictured above was purchased during this time frame and has been stored away in our bank vaults. 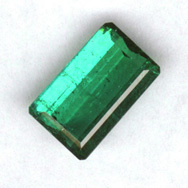 This large 5+ct stone is a mix of blue/green with small inclusions. We did have one large (4+ct) deep blue stone from the same timeframe/parcel and this was sold to a dealer in Colorado who specializes in Paraiba. We guaranteed that the stone was indeed Paraiba (note that Paraiba stones have a high percentage of gold and other elements making them different from other tourmalines. 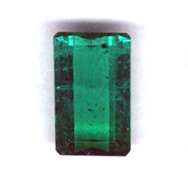 With the proper labwork, one can determine that this material is indeed from the famous Paraiba strike vs. another locality as no other localities have had the same composition). Using his past knowledge of Paraiba, the dealer heated the deep blue stone and obtained a vivid neon blue Paraiba color that he was then asking 3 times the price that he had purchased the stone for. The articles below include a recent article from Colored Stone (Tucson Show Guide - 2002) which indicate 3-4ct Paraiba stones now carry a price of $15,000 to $18,000 per carat (WHOLESALE!). Hopefully, at these prices, the gemstones should be the very intense neon blues and have minimum inclusions - though this material is known to contain inclusions and prices tend to weigh heavily on the intense color; if the inclusions are not intrusive then they may not affect the price to a large extent. Modern Jewelers Profile on Paraiba with photos and the actual article discussing the find and prices, also follows below. 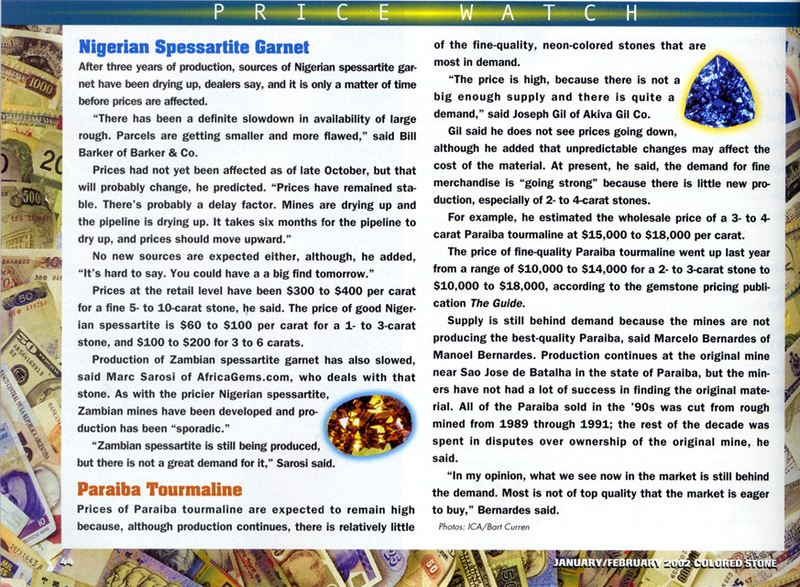 Note that the article is approximately a decade old!